Ballynure Old Boys' manager Gary Burns. Ballynure Old Boys, 14 points clear at the top of the Ballymena Intermediate Division, are on course to deliver the league title. They were idle last weekend but there was no change in the league placings on an afternoon when cup competitions took precedence. 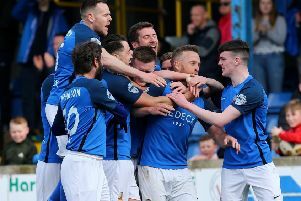 Manager Gary Burns’ star is in the ascendancy, with his side chasing trophies on four fronts at the business end of the season. With one hand already firmly on the championship crown, his side is also going strong in the Crawford, McReynolds and O’Gorman cups. Their semi-final opponents in the McReynolds Cup at Mossley are Brantwood, while Chimney Corner will be at the same venue in the semi-final of the Crawford Cup. However the Antrim lads will have home advantage at Allen Park when the teams clash in the quarter-final of the O’Gorman Cup. Interestingly, if Ballynure clear this hurdle they would face an O’Gorman Cup semi-final clash with Rathcoole – the only team to beat them this season! On Saturday main challengers Newtowne will be at Mossley for a title showdown and if Ballynure win this one the title will almost surely be in the bag.